(Nanowerk News) Scientists have long been unable to fully explain how infections attack the body, but now a team of researchers, including one from the University of Central Florida, has taken a step closer to understanding how the process works in HIV-1. The results mean that one day that knowledge may prevent infection. The result of the team's work appears in the May 30 online edition of Nature ("Mature HIV-1 capsid structure by cryo-electron microscopy and all-atom molecular dynamics"). UCF assistant professor Bo Chen specializes in complex biomolecular computer simulations also known as multiscale theory and coarse-grained model simulation. Peijun Zhang, an associate professor in the department of Structural Biology at the University of Pittsburgh led the team. Others are: Gongpu Zhao, Xin Meng, Jiying Nig, Jinwoo Ahn and Angela Gronenborn also from the University of Pittsburg; Juan R. Perilla and Klaus Schulten from the University of Illinois at Urbana-Champaign; Ernest L. Yufenyuy and Christopher Aiken from Vanderbilt University and UCF physics professor Bo Chen. Zhang has been working with cryo-electron microscopy to figure out how the HIV-1 virus creates its capsid, the protective armor around the viral genome materials, which corrupt a host cells DNA and turns them against the body. The integrity of capsids is critical to viral infection and propagation, but their structure has remained elusive because of how different each capsid can be, said UCF's Chen. That complexity is compounded because the assembly process necessary to create large protective shells includes thousands of individual proteins joining together in assembly, all of which only takes a few seconds to minutes to complete. "The speed makes it difficult to track and analyze experimentally, and even more challenging to simulate theoretically, because it involves a large amount of molecules and extends the time scale far too long for current computation resources," Chen said. 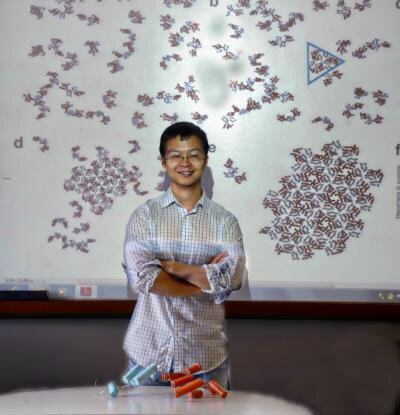 Chen came up with an advanced simulation model that captures the overall structure of the capsid protein that forms the shell without slowing down the speed, and can simulate how hundreds of capsid proteins assemble at the same time. It doesn't capture the whole system, but it is a big leap in the right direction, he said. Chen has been able to create simulations based on the general information understood by researcher to date. Compared to many other models, his simulation model is able to capture the structure information of the molecule to high fidelity without sacrificing the simulation speed. By working with Peijun, he was able to use the detailed structural information of HIV-1 she has discovered. "The mechanism is challenging to study and simulate," said Chen, who specializes in complex biomolecular computer simulations also known as multiscale theory and coarse-grained model simulation. "It involves hundreds and in some cases thousands of molecules working at the same time to assemble and construct new structures. And with our technology we've had limited success previously. But the cryoEM structure model from Dr. Zhang's group developed has greatly inspired our simulation work." The simulation gives Zhang a picture of how the process works, adding a new perspective as she tries to uncover how individual capsid proteins come together to form the large protective shell. Unlike sci-fi computers that simulate and predict how complicated organisms will react to any given stimulus in seconds, today's technology isn't quite there yet. "Even with the world's biggest supercomputers, we can't do a simulation that keeps pace with the complexities involved in self assembly for more than a few microseconds," Chen said. One microsecond is one millionth of a second. "And most of these processes take up to several seconds to minutes. In time, I think we'll get there, but right now, we're limited by our current technology. Even so, our advances are helping scientists understand how it all works." Chen isn't a patient researcher, which is why he switched from more fundamental condensed physics to applied physics in the area of biomedical sciences, in hope of seeing quicker impacts of his research to society. Despite hardware limitations, he said progress in this area of research is likely to produce benefits to mankind in his lifetime. "I wanted to see my work impact people," he said. "I'm hoping the use of my simulations will help us learn about the processes and to predict outcomes as a way to help prevent adverse health issues. While my work is focused on HIV-1 at the moment, we can apply this model to other proteins that are keys to other diseases. There's still work to do, but there is good promise here." Chen joined UCF in 2011. Previously he was a research fellow at the National Institutes of Health for four years. In 2013 he was awarded the Air Force Office of Scientific Research Young Investigator Program Award. Previously, his work has been reported in journals such as Nature Physics, Proceedings of the National Academy of Sciences and Biochemistry, among others. Chen has a Ph.D. in physics from Northwestern University and a bachelor's degree from Beijing University. He is the father of two young children is a strong advocate of teaching science to youth. He has several graduate and undergraduate students in his lab and he mentors children at an elementary school.